Functional units instead of separate classrooms, a modular architecture instead of standardized rooms—these are the demands of Berlin’s Specialist Working Group on Classroom Quality in light of the forthcoming building of numerous new schools. However, the fact is that a lot of the students in Berlin are taught in old inner-city buildings from the 19th century. In what rooms do the classes work? What would the students change about them? Which interior design interventions would make the eight hour school day more pleasant? Students from the 9th grade at the French European school, together with architects from Bauereignis Sütterlin Wagner discussed which kind of rooms schools need. 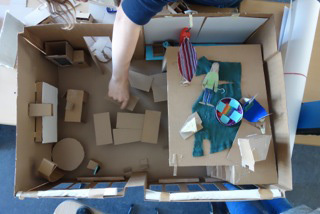 They built working models and juxtaposed their ideas to the recommendations of the Berlin Senate Department for Education, Youth and Family’s Specialist Working Group on Classroom Quality. Bauereignis Sütterlin Wagner Architects, founded by the architect and carpenter Katharina Sütterlin and the interior designer Susanne Wagner, is specialized in the development and design of versatile, multifunctional, individual rooms with praxis-oriented utilization concepts, floor plan solutions, and furnishings.